Xtremepush offers advanced features and solutions to enhance our web and mobile product offerings. Advanced scheduling options enable you to deliver intelligent campaigns to your user at the best time for them. We use our advanced AI engine to understand what is the best time based on the user data. A/B Test the time and date of delivery time to your users to determine the best time to send. Send the same message to different people at different times to understand the better time to send. 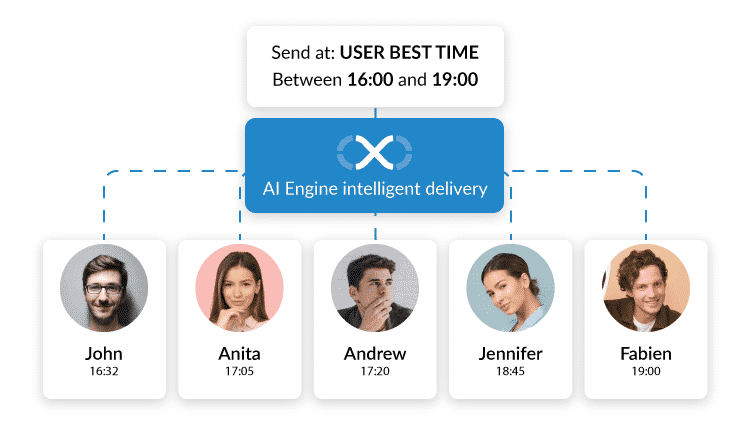 Use our AI engine to analyze individual user behaviour and deliver the message to the user at the best time. Understand your users through online and offline behaviour with in-depth analytics of in-app behaviour and geo location data. Target users with relevant messages based on previous app interactions and their preferences. Engage on their terms with personalised content tailored just for them. Dynamically create segments of your users with In-App Analytics & CRM Integrations to analyse and engage for higher personalisation and better ROI. Engage users in a contextually relevant manner through our advanced segmentation and targeting capabilities. Any segment group you want to create based on gender, age, location, preferences, app version, language. You tell us what you want and we allow you to target them. Want to know which pages, buttons, preferences your users are showing within your app? 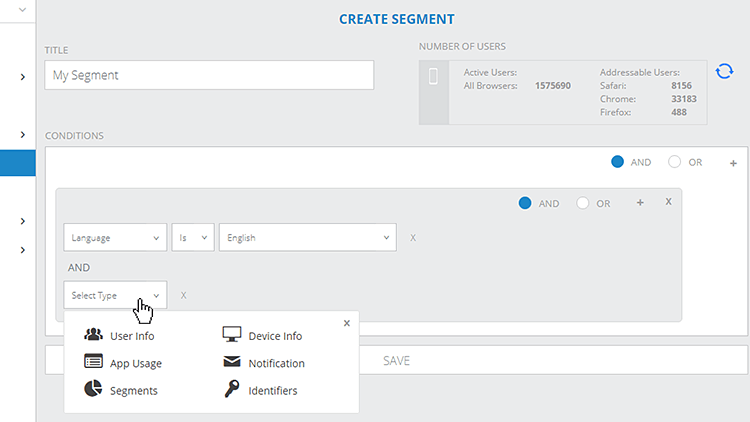 Tag any page, action or event in your app and you can segment and target those users based on that information. Easily integrate with 3rd party data to deliver omnichannel experiences. 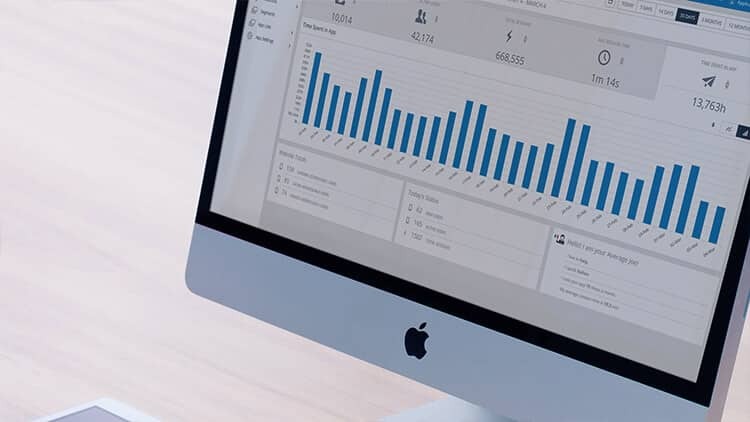 The Xtremepush platform integrates with 3rd party systems like Point Of Sales, Loyalty, and CRM systems to deliver unparalleled insights into your customers. Want to use your existing customer data to allow for deeper and more personalised segmentation? You can easily integrate with our Enterprise APIs to combine and connect customer profiles delivering the most detailed mobile marketing profile. Target users with relevant messages based on previous location behaviour, in-app behaviour, online behaviour, or loyalty systems etc. Communicate with them at the right time in the right place with messages triggered based on location entry, exit or dwell time. All of the Xtremepush features without the cost of development, maintenance and updates? Find out more about what Xtremepush White Label Solutions and Agency Agreements are available. None of the OS limitations that limit you to twenty locations. We handle scaling so you don’t have to worry about it. No need to know all your locations on day one just keep adding locations on the platform as you need them. Understand your users offline behaviour with in-depth analytics of geo-fence and iBeacon behaviour. Track entries, exits and dwell time for thousands of locations. Target users with relevant messages based on previous location behaviour. Or communicate with them at the right time in the right place with messages triggered based on location entry, exit or dwell time.